According to a report in the Fresno Bee, the notion of building a nuclear power plant near Fresno is still alive, if on life supports. California still has an effective ban on new nuclear plants. That hasn’t stopped some from pushing the plan, as Amy Standen reported for Quest last spring. And apparently some French investors haven’t given up, either. 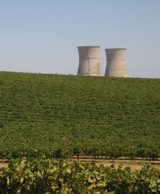 Maybe they were inspired by the juxtaposition of vineyards and cooling towers at the site of the Sacramento Municipal Utility District’s (SMUD) decommissioned Rancho Seco nuclear plant, near Lodi. Proponents of nuclear point to its mportance as a steady source of “base load” power, generated 24/7, as opposed to the intermittent or cyclical nature of many renewable sources. Do the French promise the same delays and massive cost over-runs that they recently delivered (actually are still delivering last time I checked) to the Finns? Well, I think we should _demand_ the same deal, don’t you?